All details at the Halesworth Arts Festival website. All details are available at the Turn The Tide Festival website. All details can be found at the Music at St Peter’s website. All details at the Lakeside Arts website. All details at Royal College of Music website. All details at Kettle’s Yard website. All details at the Luton Music Society website. All details are available at the Holkham Hall website. All details at the Sowerby Music website. Tickets can be bought at the Ticketsource website. The day ticket includes both the lunchtime concert at 2pm and evening concert at 7.30pm. All details at the Assembly House tickets page. All details at the St George's Bristol website. All details at BrownPaperTickets website. All details at the Fishguard International Music Festival website. All details at the Buxton Festival website. All details at the Gower Festival website. Grieg: Air and Sarabande from the Holberg Suite arranged for cello and piano. At our Farewell Concert, Tim Horton will play a Beethoven sonata and Gareth Brynmor John will sing a selection of his favourite songs and arias. The concert ends with a performance of Schubert’s String Quartet in D minor D810 “Death and the Maiden". All details can be found at the Sacconi Cruise page..
All details are available at the Great Music In Irish Houses website. All details at the Swaledale Festival website. All details at the Dunster Festival website. An entertaining and informative hour-long programme designed for children aged 5 and above, as well as the young at heart of any age! Through pieces by some of the greatest classical composers and interactive music games and activities, the audience will be introduced to the instruments of the string quartet, and the wonderful world of chamber music. Full details at the Ville-dunkerque website. Daniel Tong and eminent cellist Moray Welsh help the Sacconis bring the 11th Festival to a close with Mozart’s turbulent G minor piano quartet, and Schubert’s beloved C major quintet, which makes a return to the festival after 10 years! Hannah and Robin take temporary leave from the Quartet, and invite pianist Daniel Tong to join them for a selection of solo and duet repertoire. Plus the Sacconis perform the World Premiere of Ivan Moseley’s flute quintet with flautist Tom Hancox. Chesaba, an electrifying African trio, play music from the Ivory Coast to South Africa using sounds created from an eclectic blend of cello, kora, n'goni (African percussion), double bass and voice accompanied by the languages of Bambara, Zulu, Sotho, Tswana and more. You can expect improvisations influenced by African, Jazz and Classical Music. We take a trip to Vienna through the ages for this evening concert, where the streets resonate with the music of these three great composers. 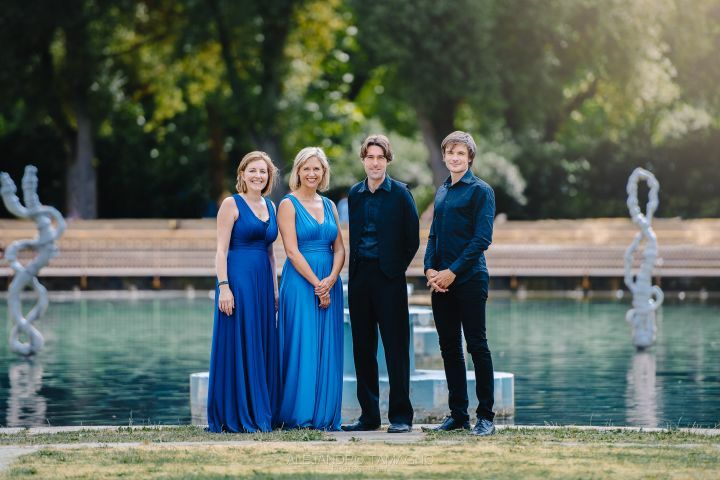 The London Bridge Trio start with a young Beethoven’s example of Classical elegance. The Sacconis then join as we take a moonlit stroll with Schoenberg’s Late Romantic tale of betrayal and forgiveness. We finish with one of the greats of the Romantic period, Brahms and his dramatic piano quintet. Our opening concert explores the full range of human emotions, from the melancholy of Shostakovich to the unbridled joy of Dvořák’s late G major quartet. Harpist Ruth Wall joins the Sacconis to perform works from their latest Fitkin CD, and Graham himself will be making a special appearance! An extended concert with two intervals. All details at the Music at St Peter’s website. All details at the Wigmore Hall website. All details at the Royal College of Music website. All details can be found at the Dorking Concertgoers website. All details can be found at the Stour Valley Arts & Music website. All details at the RCM website. All details can be found at the Southend Council Concert Club website. All details can be found at the Huddersfield Music Society website.